For years the government came for journalists and few people cared. Some even said we deserved it. Now they are going after authors and civil society activists and many still remain indifferent. The real story will come the day a blogger or a “tweep” is arrested for something they put online. That is the day we will all realise that we should have been concerned and worried all the time. Read the whole article in last week’s Sunday Monitor. I’m spending this weekend at the Al Jazeera Forum in Doha, where I was asked to participate in a seminar on the role of the blogosphere in bringing social and political change. The question posed to us — Hisham Almiraat, Mohamed Najem, Georgia Popplewell, Ramsey Tesdell, Nasser Weddady, and myself — revolved around the article Malcom Gladwell published in the New Yorker last month claiming that online connections are purely weak ties and that social media are therefore incapable of creating or sustaining a social movement. I side with those — David Weinberger, Zeynep Tunecki, and others — who have responded to Gladwell by saying that attempting to cleanly separate online and offline media (or connections, or actions) is a futile pursuit. Social media are an integral part of a new media ecosystem, one in which bloggers are amplified and inspired by more traditional forms of media and in which mainstream media outlets increasingly partner with citizen journalists to provide the most complete coverage they can. Throughout the forum, panelists have repeatedly raised this theme, arguing that framing media as old versus new or mainstream versus citizen is not a productive approach to understanding the impact of online networks. Speakers who work with major news outlets have thanked bloggers for sharing their first-hand accounts of what’s happening on the ground, while bloggers have thanked major news outlets for broadcasting their reports. In a break-out discussion on Saturday, citizen journalists from Tunisia and Egypt said that Al Jazeera’s amplification of their voices helped bring the situations in these countries to a tipping point. This idea of a media ecology is one I’ve been mulling over as I’ve been working with the Technology for Transparency Network over the past year. We’ve interviewed more than 60 organizations who use digital tools to promote transparency and accountability in their governments, and one of our key conclusions has been that organizations who build partnerships with traditional media organizations — whether these are local radio stations or major national newspapers — tend to have more success than organizations that rely solely on the Internet to get their message across. For me, it’s been interesting to hear that this is the case not only when talking about city budget transparency, but also when talking about revolutions. I don’t think this in any way diminishes the importance of social media in the movement for government accountability. In many cases, both local radio stations and national papers (and, as I’ve heard this weekend, Al Jazeera) would be unable to report on the stories they cover without the help of bloggers and tweeters. I’m glad to see that those who are here at the forum — both traditional and citizen journalists — are willing to exlore these partnerships and acknowledge their importance. SIPA Shushing Students over CableGate. Seriously? Yesterday a friend forwarded me a link to a blog post about Wikileaks. Not surprising, given the number of Wikileaks-related blog posts that are floating around the Internet in the wake of the organization’s release of a quarter of a million U.S. Embassy cables. But this blog post was different: this blog post referenced the Columbia University School of International and Public Affairs (SIPA), from which I graduated six months ago. I’m currently happily employed at the Berkman Center for Internet & Society, but while I was at SIPA I seriously considered a career in the Foreign Service. I applied for (and was offered) a summer internship at the State Department, and I coordinated a conference on Policy Making in the Digital Age, at which the State Department’s Director of the Office of eDiplomacy and a representative of the Office of Innovative Engagement spoke. I guess I can kiss that possible alternate career path goodbye, given that I tweeted a link yesterday to an article about CableGate. Seriously, State Department? This is all over the news. What’s more, it’s become a focal point for discussions on how digital technology is changing our expectations for government transparency (for those who’ve forgotten: the State Department is big on using tech to promote transparency in other countries. Just not here in the US?). Seriously, SIPA? As fellow SIPA alum Ben Colmery pointed out in a comment on my Facebook wall, since when does having an opinion about a site leaking documents equate to actually leaking documents oneself? You claim to provide committed students with the necessary skills and perspectives to become responsible leaders. Apparently that means curtailing their academic freedom and teaching them how to bury their heads in the sand. Posted on December 3, 2010 Categories international politics, SIPA, social media, technology, u.s. foreign policy9 Comments on SIPA Shushing Students over CableGate. Seriously? US-based ‘activism’ campaigns are often more about cause marketing or branding an organization or collecting emails than they are about changing a serious social issue at home or abroad. This is not the fault of the social media tools or of ‘digital activism’, it’s a reflection of US culture, our current values, the organizers behind the causes, and the sociopolitical moment we are living in. I think there is a risk of a US-centric critique of all digital activism as ‘slactivism’, when that is not always the case. Should we call out the US media and those people who are hyping up social media as the key factor in social and opposition movements such as recent ones in Iran or Moldova? Yes. Should we in the US take a closer look at and question what’s behind our shallowness and cultural propensity towards ‘slactivism?’ Definitely. But we should also be careful about projecting our weaknesses and cultural frameworks on all use of social media tools in activism. Last summer I built a set of maps for the OpenNet Initiative showing where five of the most popular social media sites — Facebook, Flickr, Orkut, Twitter and YouTube — are censored around the world. These are accurate to the best of my and ONI’s knowledge — the data comes from testing we conducted in 2008-2009 as well as from censorship reporting site Herdict and media reports. If you have trouble accessing one of these sites, please let us know so we can update accordingly. For more information on the methodology and reasoning behind these maps, and for all the fun features (clicking! zooming! changing from Facebook to Twitter and back again! 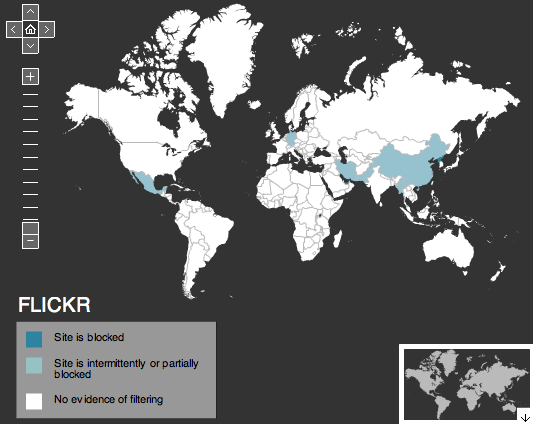 ), check out the social media filtering map on the ONI site.